We've all got our 10 Best Movies lists, often subconsciously adjusted to include a few impressive titles that we wouldn't actually want to see with any great frequency. Then there's the short list of what I call Can't Nots: movies which, should you come upon them in progress, cannot be exited. No matter how many times you've seen the damn thing, you get sucked into it again; you simply Can't Not Watch It. Tootsie has long topped my Can't Not list, and it tends to be one of the few American comedies that cinefiles and civilians alike revere (it's second only to Some Like It Hot -- the movie that's clearly its role model -- at the top of the AFI 100 Funniest Movies list). I've yet to meet the curmudgeon who doesn't acknowledge it as a bonafide masterpiece, and would rather not, thanks. Thus it's about time the lady got her props. The movie's 25th Anniversary Edition has finally given Tootsie the royal treatment; while it's not packed with extras, it delivers an hour-long, immensely satisfying "Making of" documentary (made by Charles Kiselyak), which makes a Tootsie lover's purchase of the new edition mandatory. Although some may not think of Tootsie as a romantic comedy, it absolutely is one, with its high concept gender-switch story inextricable from its rom-com plot: you could call it a boy-as-girl meets girl story (boy-as-boy gets girl in the end). So one could make a case for it as one of the most popular romantic comedies ever made, setting unlikely heroine Dorothy Michaels right alongside you know -- that girl with the really toothy smile. I've written about the reasons for this extensively in my Writing the Romantic Comedy book, but Tootsie's re-release allows me to amplify a few points, in the light of revelations from that "Making of" doc. One reason for the movie's stature is its script, a fascinating case of the exception that proves the rule. "Written by committee" has become the favored pejorative phrase with which critics often deride Hollywood's multi-writered products. And yet Tootsie -- as the documentary bears out -- is exactly that. A script by Don McGuire and Bob Kaufman came to the attention of Hoffman and writer Murray Schisgal, who'd been playing with the gender-bend notion for some time. Comedy ace Larry Gelbart came on when Schisgal was played out, and then Elaine May revised him -- while Pollack and Hoffman continued to shape and reshape what could have easily become a misbegotten mess into cinematic gold. And now it can be told, in specifics: it was the uncredited May who brought in the entire dizzying daisy-chain of supports and subplots that raised the stakes of the story and the level of its humor to sublime, Feydeau-ian farce. That Ms. May continues to be one of the more under-appreciated (outside of the industry, that is) screenwriters of our age is a shame that this documentary should help assuage. Viewing the movie at this late date I was struck by how not smile-inducing amusing, but laugh-out-loud Funny it is. While the whole conceit is grounded in a comedic reversal (man as woman), the range and tenor of the laughs, scene by scene, is kind of astounding. For example, there's the bit where Michael Dorsey minus his Dorothy Michaels get-up tries to seduce Julie (Jessica Lange) at a party by using the very words Julie used when she told Dorothy what she'd like a man to say to her: "I could lay a whole bunch of lines on you..." he tells Julie, "but the simple truth is, I find you very interesting, and I'd really like to make love to you." Julie's response is to throw her drink in his face. Great laugh -- then Michael, embarrassed but ballsy as ever, uses the back of an unsuspecting fellow guest's jacket to wipe off his face. And we laugh again. Such laughs-upon-laughs are the common coin in this realm. In one of the great comedic climaxes of all time, the staircase confessional scene, as Dorothy finally reveals her true Michael identity, note how each and every cutaway from Hoffman's big moment gets its own specific laugh: Terri Garr's scream, a technician's faint, Charles Durning's sandwich drop, to Bill Murray's immortal "That is one nutty hospital." And in terms of setting up and paying off an extended joke in the most perfectly surprising way, I need only remind Tootsie devotees of one phrase from much earlier in the show: "We call him The Tongue." The movie also embodies a primal comedy principle: you have to take it seriously. "We never, ever laughed on that set," Pollack notes in the documentary. "It's not laugh comedy -- it is for the audience, but not for us -- it's Chekhov." That's why every character in the movie is a crack-up: their funniness is directly proportionate to how seriously they continue to take themselves. Another reason the movie has endured is of course its stellar cast. After Graduate and Cowboy, Dustin Hoffman really IS a better man as a woman than he ever was as a man in Rain Man, etc. Director? Sydney Pollack best agent ever. And part for part -- from Terri Garr's perfectly pitched neurotic hysteria to (famously uncredited) Bill Murray's loopy laid-backness -- there's simply not a less than great performance in the movie (or in some cases, great appearance: red-blooded males in the audience continue to savor the screen debut of young Geena Davis). Writing, casting, brilliant direction aside (Pollack was in the peak-streak of his career in '82, and unbelievably, had never helmed a comedy before), another fundamental factor in Tootsie's greatness is its ideas. Memorable gags, riffs and character bits abound in the movie, but what makes all of it hang together is the solid "what it's about" at the core. The question of "what makes it personal?" often comes up in screenwriting classes. One of the most affecting moments in the documentary comes when today's Dustin Hoffman, recounting how, when he'd settled into his makeup as Dorothy and comprehended that he was not a good-looking woman, he understood for the first time what it must be like to be a woman trying to be appreciated in an appearance-obsessed, sexist world. Hoffman tears up as he talks about this, and he seems entirely sincere: years after the fact, his visceral experience of "womanhood" is still getting to him. This is, finally, what makes Tootsie a can't-stop-watching-it classic: by examining -- often in the midst of the most farcical high jinks -- what is masculinity, what is femininity, "what it means for a man to see himself through the eyes of a woman," as Pollack says... the movie gets us where we live. And now that we've got a neat new edition Tootsie to live with, you can just dip into it one brief clip at a time. Like, I'd like to watch the Russian Tea Room scene again where Pollack first sees Hoffman in drag and says, "Michael, I begged you to get therapy!" And then... Oh, who am I kidding? There goes the next couple of hours. GREAT job honoring "Tootsie," Billy. Very interesting insights into how this classic came together. Could feel my eyeballs begin burning in my sockets looking at that HOT picture of Geena Davis. Dustin Hoffman's like my most favorite actor ever. Jessica Lange's right up there too. But the name that really stuck with me in this post was, Elaine May. Having read your book, "Writing the Romantic Comedy" like a gazillion times, I remembered that you cited her as an emerging talent in the "70s: The Modern Era." Actually doing doing a litte IMBD homework on Elaine May I found that she was nominated for an Oscar for writing twice: "Heaven Can Wait" in 1979, and for "Primary Colors" in 1999. 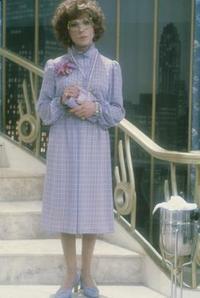 In 1994 she won an lifetime acheivement in comedy award. She's also wrote "The Birdcage," with her last movie being 2001's "Down to Earth," which stared Chris Rock, Eugene Levy, and Chazz Palminteri. Elaine May has had quite the career -- we should all be so lucky. Thanks for this, Billy! I enjoy your blog and check back often. I'm working on a gender-bender comedy in this tradition. Your reminder about sight gags and Elaine May was exactly what I needed to hear today. Thanks for the inspiration! Yup, I'll buy that one. Tootsie's definitely in my "Top Ten To Learn From" collection. It's just what a movie should be. A slice of your own life. That you love to revisit. Because it does a better job of living it than you do! Yes, that's me in the blue-mauve dress on the stairway. True comedy is tragedy, every time. Writers remember, it's not just about plot - your job is to give the actors something to ACT! 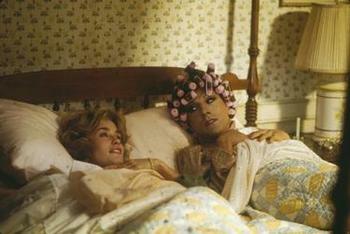 Just the way they did in Tootsie. What's my favourite scene? The superb Bill Murray's "not that kind of girl" speech. EC: Thanks for the Elaine May career summary -- here's hoping we get to see her working on something new. Welcome, Deanna! We aim to please. Scooter: PULP's definitely a perennial for me. Joanna: Murray is priceless in this movie. Welcome, Ally: Though I don't have any fresh info, I've heard the same rumor and for your sake hope it comes true. I caught Tootsie when it was in theaters. I thought it was okay. I wanted more explosions. Then I watched it again in 1992. My living room was like a Memorex ad. I had to strap in. The comedy in that film is firing on every cylinder it's got. There's not a single misplaced line, a single wrong gesture. When I watch the scene in which Michael Dorsey confronts his agent about The Iceman Cometh, my heart beats faster. Even from my own, typically cynical, music perspective, I even think Dave Gruisin's score for the film is comic gold. I need to check out that doc. All these years I've been worshipping before a shrine to Larry Gelbart. That Elaine May had a huge hand is a detail I find fascinating. And I'm going to dig deeper into this. A remarkable film. Thanks for bringing it up. Oh, and I'm still digging your music tastes. From Lupe Fiasco to Throw Me The Statue. Good stuff. Thanks for the post and the wonderful photos from this great movie. 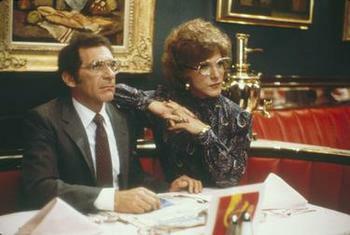 "Tootsie" is one of my all-time favorite films. No film since has done such an outstanding job with multiple subplots. Thanks, Will -- I love that image of being strapped in to watch TOOTSIE. You might check out Elaine May's A NEW LEAF: great black comedy with Walter Matthau. Diane: Right?! How many other movies have done mutliple so well? We, too, published an article today about Sydney Pollack, and we referenced the article you published on the 25th Anniversary of TOOTSIE. It was great! Also, I notice you're doing another class soon. We'd be happy to help promote it with a mention on our site - just email me. 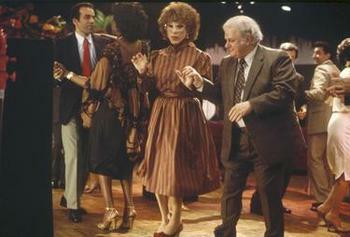 I just love "Tootsie" even after 25 years. It is no doubt about it a classic. I am currently transgendered and learn about myself a lot and I thank "Tootsie" for helping understand myself a whole lot better. Mary: ¡Estoy de acuerdo con tigo! Es una de las peliculas que me gustaria ver otra vez. it is very nice post for comedy. laughing is to necessary for health.this post is too useful for too busy people.this article is proved some smile for busy peoples. Thank you Emey: "Some smile for busy peoples" is the best kind of high praise. So excited to find this blog! I am a HUGE romcom fan. Can't wait to sit down with some coffee and read through all your archives! Welcome MissMichaels: Happy to be read, and to have another romcom lover on board! ''You know what i wish"? that for once a guy could walk up to me and say "hey you know im confused about this too. ''I could lay a big line on you we could do alot of roleplaying but the truth is i find you very intresting and i'd raelly like to make love with you". ''simple as that" the only problem is when he says the line to her he does it his own way and it doesn't quite work out . Micheal at the party introduces himself. "Hi Mike Dorsey" . "mmm hmm" goes Julie feeling not intrested. "great party only Phil could afford all those lights" he says. yet she's still not into him. "You know i could lay a big line on you and we could do alot of roleplaying but the truth is i find you very intresting and i'd really like to make love to you" . she throws a drink in his face while he finshes the sentence "its as simple as that" he says. see? he did it hiw way oh well atleast he tried.